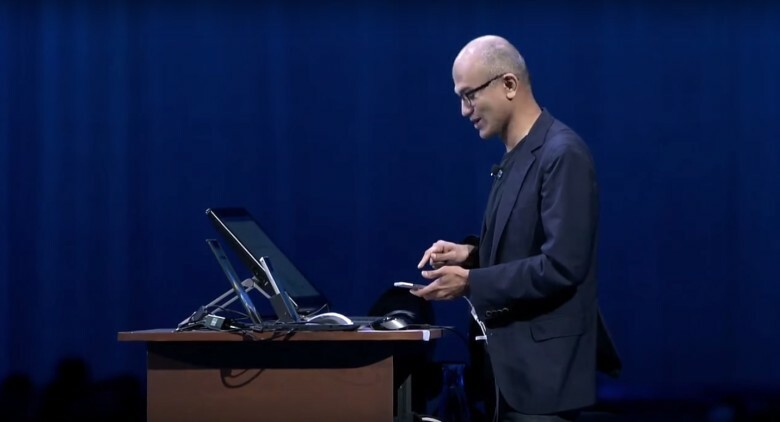 Microsoft's CEO loves the iPhone. Microsoft CEO Satya Nadella was spotted using an iPhone at Salesforce’s Dreamforce conference this week, and while Nadella insisted the device wasn’t actually his, he was all too proud to show off the amazing apps his company is making for it. Nadella even gave his device a new name, dubbing it the ‘iPhone Pro’ (a little knock on the iPad Pro that was recently announced) because it was running all of Microsoft’s apps. Microsoft didn’t make any major announcements at the Dreamforce conference, but did show off many of the tools it’s developing to make conducting business on the iPhone easier than ever. Nadella’s demo is another sign of how quickly the sure are changing at Microsoft now that Steve Ballmer no longer reigns over the company. Microsoft has gone from the biggest iPhone hater, to becoming the best iOS developer in the world in under two years thanks to CEO Satya Nadella’s decision to bring Microsofts best apps to all platforms.